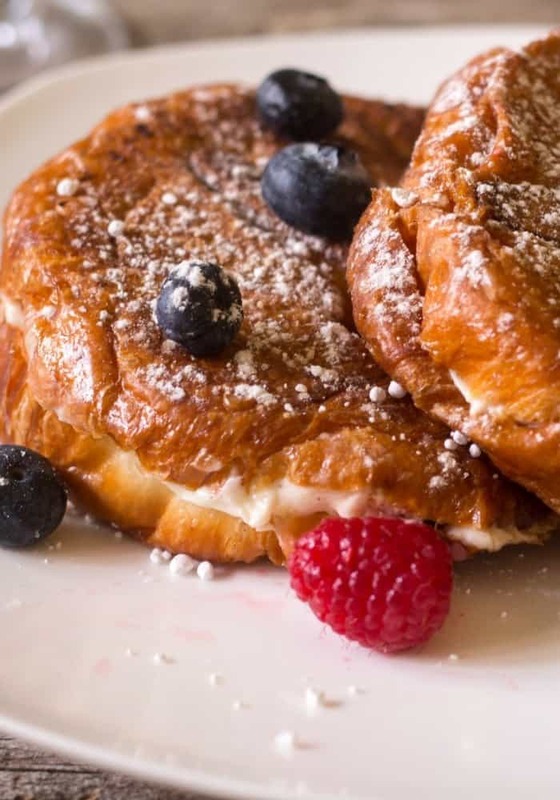 Enjoy an easy and most delicious breakfast that is always a crowd pleaser, Berries, and Cream Stuffed French Toast Croissants! A perfect Thanksgiving, Christmas or New Year’s Day breakfast! We have many food celebration days, today is one that is a personal favorite, National French Toast Day! To celebrate, I have teamed with a few of my favorite food bloggers to celebrate! I am sharing a family favorite, Berries and Cream French Toast Stuffed Croissants because it is absolutely yummy! This french toast is super versatile to please everyone in the family! I can adjust the fruit if needed to please everyone. My family is not any different from most..we are always running and the day starts early! Usually a quick bowl of cereal, ready-made Healthy Vegetable Egg Muffin Cup , Avocado Egg Toast, or a quick Smoothie! When we have a weekend day, or a Holiday like Thanksgiving or Christmas, we make it count! I love a relaxing morning with lots of fun, laughter and great food. 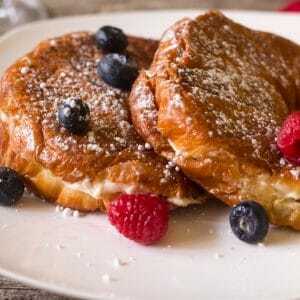 Berries and Cream Stuffed French Toast Croissants delivers a delish breakfast that makes everyone happy! Bring the low-fat cream cheese to room temperature, makes it easier to blend. Using almond extract brings a different flavor that I prefer, vanilla extract works as well. The cream cheese layer is thin because it packs a lot of flavor. I use bananas and fresh raspberries. Feel free to adjust the fruit to your families taste. When fresh fruit is unavailable, add fresh fruit preserves to the base of the croissant, also delicious. Use your impeccably clean hands to carefully coat the croissants with the egg wash and flip them with the egg mixture to keep the fruit inside. Breakfast is my favorite meal of the day and these stuffed berry croissants are absolutely fabulous. I will say these stuffed croissants are a more indulgent breakfast for my family. The stuffed croissants are perfect for special days like Christmas, Thanksgiving and New Years Day morning. With that said, my boys could eat these 3 times a day, yes 3 times a day! I will say, having my younger son home for the Holidays this year, I make these a lot! As having him home is a Holiday everyday! 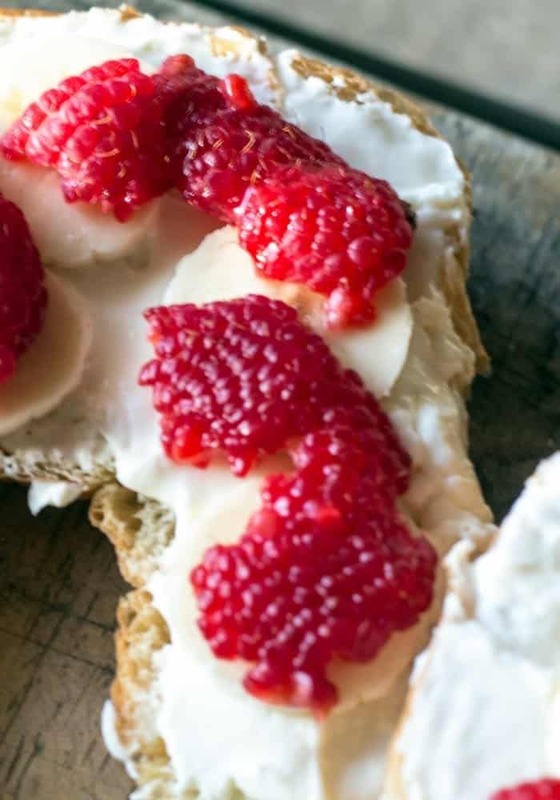 An easy and tasty breakfast filled with a creamy stuffing from bananas, raspberries and cream cheese! A perfect breakfast for special mornings like Christmas, New Years and Mothers Day. In a small bowl combine the cream cheese, confectioners sugar, orange juice and almond extract. Set aside. Preheat a skillet over medium heat or a griddle to 350 degrees. To a large bowl add and whisk to eggs, low-fat milk, ground cinnamon and vanilla extract. Set aside. On the bottom of each croissant, add 2 Tablespoons of the cream, banana slices and 4 raspberries. Place top on each croissant. Spray the griddle with the non-stick cooking spray. Place each croissant into the egg wash. Carefully flip to coat the croissants to cover completely each croissant and place on griddle or pan. Cook on each side about 4 minutes to cook completely through. Serve with extra fruit and pure maple syrup. Adjust fruit according to your family. Follow along on PINTEREST! I’m always pinning from talented and amazing bloggers with creative recipe and DIY ideas! Tag #everydayeileen or @everyday_eileen on Instagram with your recreations of my recipes! Love seeing and sharing what you create! These look delicious! I love croissants so can imagine this is great too. 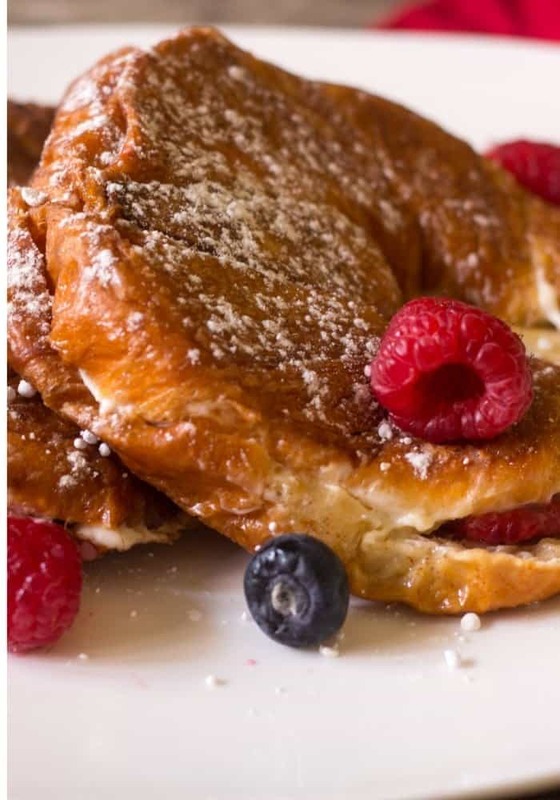 I’ll bet the texture of this French toast is amazing with airy croissants! 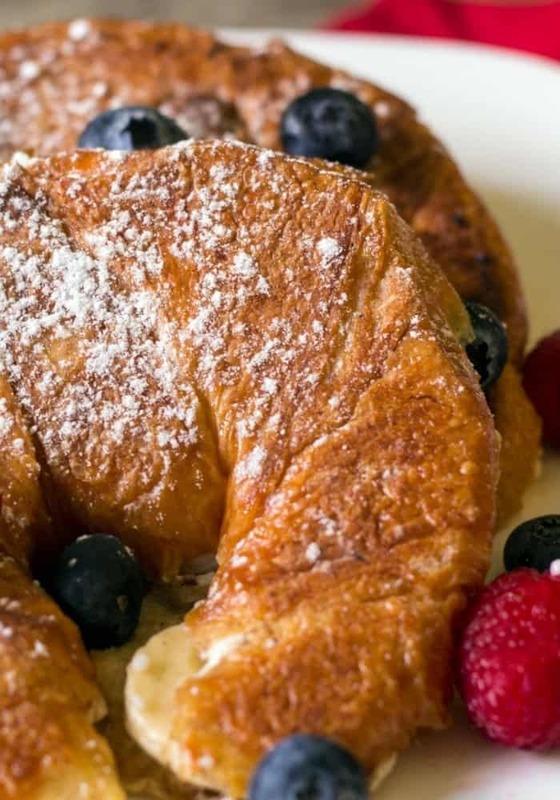 French Toast Croissants?!? AMAZING!!!! I love everything about this! Thank you Amy, we love it too! I had never thought of using croissants for french toast but it would be amazingly buttery, I would imagine! I love the idea of pairing it with berries and cream! 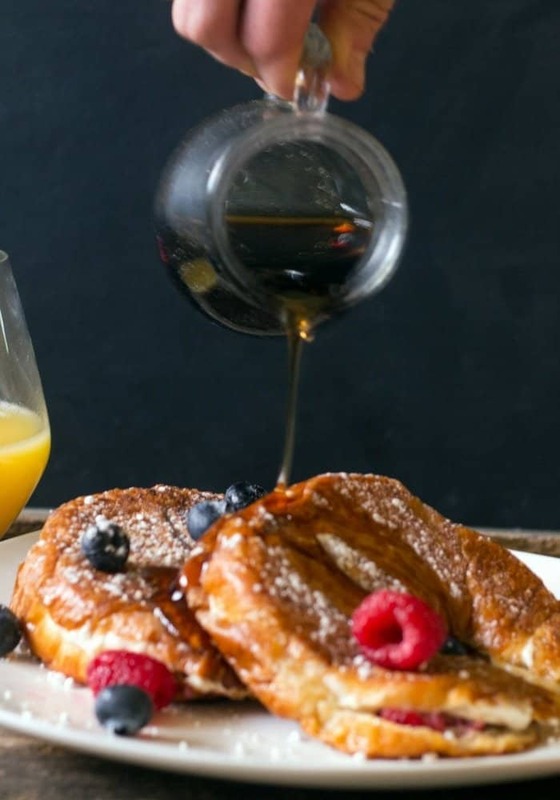 What could be better than French Toast made with croissants! Love this recipe, and I am looking forward to trying it! Just delicious! I wish it were still berry season. I will definitely make this once I can get my hands on some fresh berries. What a perfect breakfast for Christmas morning. Thanks for sharing. This looks great! I’ve made French toast with croissant before and loved them. The texture was nice and light.